Kingsley’s unique and unforgettable voice will warm you up and melt you down. Her presence is captivating and overwhelming, she sings only on her personal experiences of life, love, and her journey of becoming Kingsley. 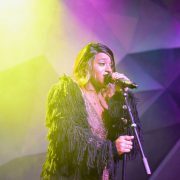 Kingsley doesn’t just stick with one genre, her vocal can do anything – her song are influenced by pop to R&B and anything in between! Kingsley has been making strong headway with opening up for acts like Elise Trouw, VHS Collection and SG Lewis! Kingsley newest EP, I Am Because I Dance, released in February 2019! This EP was originally created back in Oct of 2018 – I was asked to open for SG Lewis as local support, but they did not want my full band to play. They asked me if I could do a DJ set – though I’d never done a DJ set before, I said hell yes. I called my good friend, Yoswayy and explained the position I was in. I seriously asked him if I should just press play on my iPhone to instrumentals tracks, he cracked up and said he would remix my songs to make this DJ set work. The sold-out show was a success and the remixed songs were well received. Tons of people kept asking where they can listen to the music online – after the come down from the high, I realized that instead of trying to create an entirely new EP, I should release the remixes Yoswayy did.Giving birth to the project, Twelve Months of Kingsley. Each month, on the 23rd, she will be releasing something – from music videos to 2 EPs to summer pop inspired singles!